Are you looking for an outsourcing partner that provides more than just butts in seats? At nowanalytics, we go beyond just handling customer interactions for our clients. The nowanalytics difference starts from our initial interactions to program design and service delivery. As we say, intelligence is a way of thinking, powered by the platform, processes and people to represent your brand well. 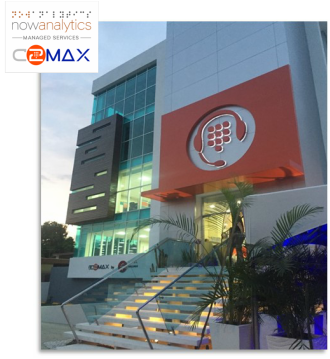 Whether you are based in our state-of-the-art near-shore contact center in Santiago, Dominican Republic, or if your program is based out of our managed services partner facilities in the United States or abroad, the nowanalytics managed services delivery capabilities come into action. We spend time to understand your business strategy and brand promise. Then we develop a program design that delivers the value that you are looking for, and then we go and execute. We provide you full visibility on the programs that we manage for you using the power of our platform. If you desire, you can track the performance for every program, agent or interaction from your home or office, throughout the day, as if you were on-site. Beyond the value of great performance and representing your brand promise, our outsourcing services offer the ability to provide you insights on your markets, customers and products. We bring the power of our business intelligence capabilities to increase the value that you gain from every customer interaction. Are you ready to work with a partner that delivers quality, performance and strategic value? Then it's time to talk to us. Greater quantitative visibility into your operations. Identify opportunities for process improvements. Identify process issues that drive negative customer experiences. Drive measurable improvements in ALL your contact center operations. Design customer interactions that drive higher satisfaction and loyalty. Identify gaps in product, services and offers. Understand why customers buy what they buy from you. Analyze the customer experience journey to make it easy for customers to purchase from you. Understand churn and its drivers. Statistical sampling of quality monitoring for fair assessment of individual agents. Process, product and service issues identification to understand the drivers of satisfaction/dissatisfaction. Interaction flow optimization to improve efficiency and outcome. Cross-channel customer journey mapping and trace to optimize interaction channel usage.